Home » stigma » Anti-vaccine ads on Delta planes; Magic and Ellen as celebrity champions for HIV/AIDS prevention...and more- What Am I Reading This Week? Anti-vaccine ads on Delta planes; Magic and Ellen as celebrity champions for HIV/AIDS prevention...and more- What Am I Reading This Week? 1. Darrell Hammond of Saturday Night Live fame reveals that child abuse led to alcohol/drug use and cutting. 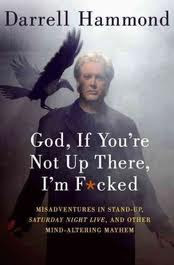 He details the horrific abuse in a new memoir, "God, If You're Not Up There, I'm F*cked". 2. Fellow Boston University School of Public Health alum Elizabeth Cohen reports on the 20th anniversary of Magic Johnson's announcement that he is HIV positive. His announcement had an incredible impact on the public's health- both in terms of reducing stigma of those diagnosed and proving that the diagnosis is not always a death sentence. 3. Delta airlines is seeing backlash from public health organizations and other flu vaccine advocates after airing a 3-minute PSA from the National Vaccine Information Center that describes alternate ways to avoid the flu (besides getting the flu shot). 4. Ellen DeGeneres is named global envoy for AIDS awareness. The hope is that Ellen's enormous platform (from both her TV show and social media channels) will allow her to reach millions of people with the prevention message. Ellen is a partner in other important public health issues, for example- bullying prevention. 5. This week, Evelyn Lauder passed away from Ovarian Cancer. Evelyn was one of the powers behind the creation of the pink ribbon campaign for breast cancer awareness. Related Posts : Anti-vaccine ads on Delta planes; Magic and Ellen as celebrity champions for HIV/AIDS prevention...and more- What Am I Reading This Week?